Hi, my name is Vickie Warburton, and I'm addicted to beads. In fact, I LOVE beads and have for as far back as I can remember! Remember "love beads" and Daisy chains? (Ok, my age is showing here!) From my humble beginnings stringing bright plastic beads I’ve advanced to complex peyote stitch designs. 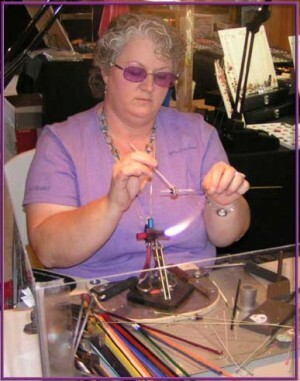 While that was fun, and time consuming, my muse awakened the first moment I admired the beautiful and complex lampwork beads of artists such as Leah Fairbanks and Kim Osibin. They were captivating. They were fascinating. I was enthralled. Heck, I was spellbound! Soon after that, my love affair with glass and fire began. Unlike my other artistic ventures of the past, I don’t foresee my passion for flameworking cooling. I've been creating flameworked beads for about 6 years, and I relish every minute of it! At least once a year, I try to attend a workshop to “fire up” the ole’ creativity, and advance my skills, as well as learn new ones. If you see something you like, better snag it, for rarely do I reproduce a set of beads. Can you keep a secret? Usually it’s because I can't remember what I did. You'd think I'd take notes, wouldn't you? But who has time for all that writing when there’s glass to be melted?